DBD34 (500) Goldstar - VM36 Mikuni Carb Conversion - Allens Performance Ltd. Allens Performance Ltd. 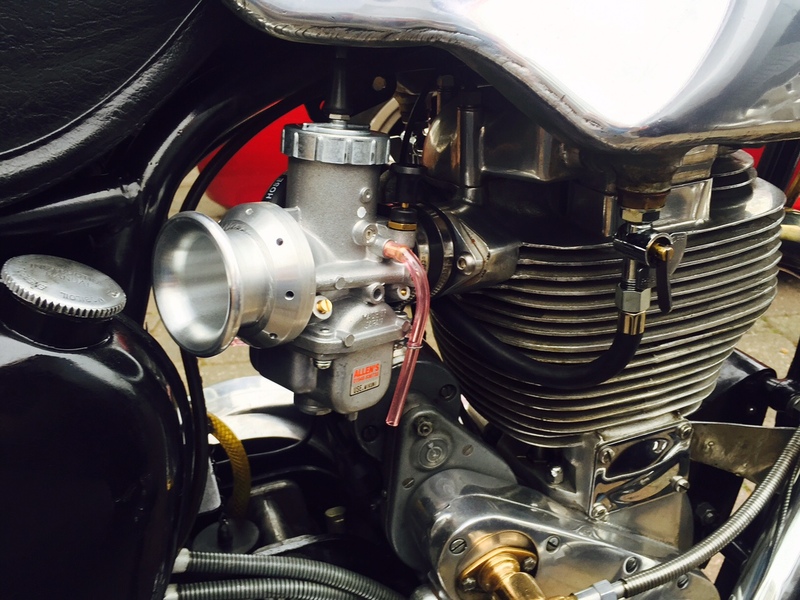 Although the Mikuni VM36 is smaller than the original fit Amal GP carb fitted to the Goldstar, dyno testing has shown that the 36mm bore carb produces superior low and midrange power without sacrificing top end on a standard specification machine. We can supply a 38mm carb if required, however. The carbs are supplied machined by our technicians with a special Allens billet velocity stack fitted to give the correct tract length and linear airflow. The Mikuni Carb supplied will make cold or hot starting easier, also allow a constant tickover. The smooth, even delivery of power will be very pleasing. Such a bike should be a pleasure to own! I recently purchased a kit for my Goldie, following a dismal period with the original Amal GP when it proved almost impossible to start with a warm engine. The consensus from other Gold Star owners was that I needed the ‘knack’ and one had to persevere, despite owning three other British 500 singles; the Gold Star is that ‘special’. What tosh, it’s just an old bike with a rubbish- for-road use carb fitted. Furthermore, regular plug changes were deemed necessary if it wouldn’t start 3rd kick and the Goldie rider is expected to carry spare plugs strung about his chest like a bullet bandolier. Let’s not even think about the inevitable stripped threads resulting from that. Having endured this nonsense for a couple of months and reaching the point where I was beginning to avoid riding it, I opted for one of your kits. It was extremely simple to install, it must have taken half an hour from start to finish and that included making new fuel hoses, not what I’ve come to expect with old British bikes at all! With some trepidation, I kicked it over and it fired first kick, I adjusted the idle a bit and went for a ride, perfect in every way. I then stopped and re-started it, first kick every time, which it continues to do. I’ve subsequently dropped the needle one position as it seems a trifle rich and if anything, it’s even better. The plug’s not been out since I checked and it looked like a caramel toffee.